Spanish voters are to go to the polls in a landmark election that will see more than two parties compete for power for the first time in decades. Newcomers Podemos, an anti-austerity party, and Citizens, a liberal party, are challenging the ruling Popular Party (PP) and the Socialists. 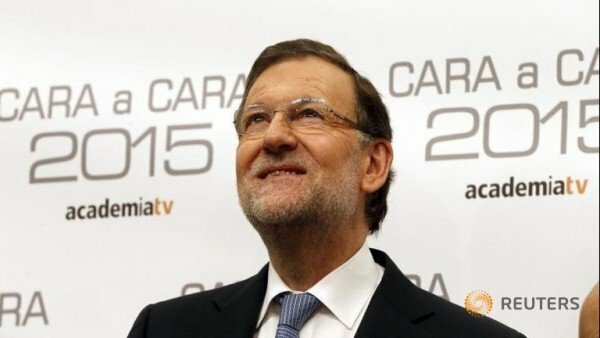 Opinion polls have put PM Mariano Rajoy’s PP narrowly ahead. While he has been in power, Spain has emerged from a financial crisis into a period of economic growth. The conservative PP currently has a majority in Spain’s lower house of parliament. Podemos and Citizens are fielding national candidates for the first time. Both Podemos and Citizens look set to take a take a large chunk of the vote, ending the power monopoly of Spain’s traditional heavyweights. It is almost certain that no party will get a majority of lawmakers in the parliament meaning some form of coalition will have to be agreed before a government can be formed. Spanish politics have been dominated by the economy, corruption allegations and a separatist drive in the prosperous northeastern region of Catalonia. Mariano Rajoy’s administration adopted unpopular austerity measures and job reforms that have been credited with returning the Spanish economy to growth. However, unemployment remains high at 21%, the second-highest rate in the EU after Greece, although it has fallen from its 2013 peak of 27%. The PP has also been damaged by corruption scandals. The central government in Madrid has also had to contend with an attempt by Catalonia to breal away from the rest of Spain. Pro-independence parties in Catalonia won an absolute majority in regional elections in September and a month later passed a motion to begin the process of declaring independence. Spain’s Constitutional Court has revoked that motion, but Catalonia’s leaders said they would ignore it. Mariano Rajoy has vowed to quash the threat to Spanish unity, but other parties favor negotiations to devolve more power to the region, which accounts for about a fifth of Spain’s economic output. Ahead of the vote, the party leaders made a point of relaxing as they observed a “day of reflection”. Mariano Rajoy said he wanted some fresh air and went for a jog around the official prime minister’s residence. However his campaign was marred last week after a teenager punched him in the face during a visit to the town of Pontevedra in the northwest. Mariano Rajoy has also raised questions about his future by including his deputy, Soraya Saenz de Santamaria, on campaign posters and fielding her in his place during a leaders TV debate. Meanwhile Socialist leader Pedro Sanchez, a 43-year-old former basketball player, watched his daughters play basketball match and Pablo Iglesias booked a ticket for the new Star Wars movie. Polling stations open at 9AM and close at 8PM. Exit polls are expected minutes afterwards and complete results are due two days later.